Sliced onions stfrred through chickpea batter and flash fried. Triangular pastry filled with potatoes and peas, succulently flavoured wlth spices. Chopped vegetables spiced and dipped in batter then deep fried. Cottage cheese pieces marinated with yoghurt, spices and then cooked In oven. Cottage cheese pieces marinated with yoghurt and chana flour, spices and then cooked in deep fried. A delicacy of spinach stuffed with cottage cheese, nuts and herbs and shallow deep fried. Vegetable sarnosa, onion bhaji, vegetable pakora and springs rolls. Cottage Cheese pieces fired with cornflour cooked with chilli sauce, soy sauce, capsicum and onion. Juicy morsels of boneless chicken marinated In spices overnight and slow roasted in the tandoor. Boneless chicken dipped in spiced batter and deep fried. Chicken pieces marinated with yoghurt, spices and then cooked in oven. Skewered lamb imbued with spices and cooked over the tandoor. Boneless chicken pieces cooked with comfelour chilli sauce and soy sauce, capsicums and onion, served in semi dry gravy. Prawns steeped in egg batter, flash fried in vegetable oil and served amidst green salad featuring Indian 2nite sweet and sour sauce. Indian style - marinated in spices and lemon juice, deep fried later. Lentils stewed on slow.,fire ovemight, gamished with ginger and coriander. Fresh potato cooked with cumin seed and herbs. Fresh mixed vegetables cooked in creamy sauce. A laid back and lightly spiced puree of spinach with your choice of potato or cottage cheese. Mashed potatoes and cottage cheese balls deep fried and cooked in rich gravy. Cottage cheese cooked in a special pan with onion, capsicum, special blend of masala. Potatoes, cottage cheese and peas cooked together in a subtle spicy gravy. Cubes of cottage cheese cooked in cashew tomato flavoured sauce. Mushroom and green beans cooked with garlic, cream and spices. Cubes of cottage cheese cooked in cashew nut, tomato flavoured sauce. Paneer/ mushroom cooked in onion , tomato gravy with diced onion & capsicum. Tender pieces of boneless chicken half cooked in tandoor and finished in a creamy tomato flavoured sauce. Boneless pieces of chicken cooked in cashew nut and yoghurt sauce then garnished with cream (chefs special). Spicy curry straight from the beaches of Goa, cooked in hot vindaloo sauce. Goes well with raita (recommended by chefs). 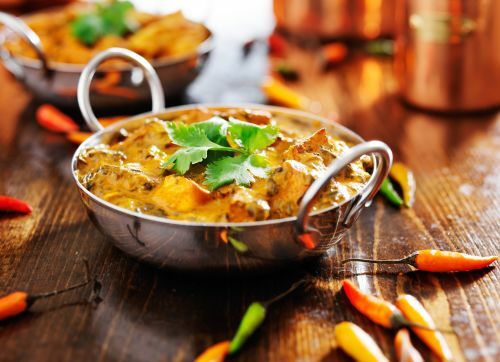 Delicious curry garnished and prepared with coconut sauce in South Indian style. Cooked in a wok in a spicy blend of masala. Succulent tender chicken pieces cooked in a spicy sauce with green peppers and sliced onions. Fresh tender cooked chicken with tomatoes and coriander powder, cumin powder with rich onion gravy. Tender pieces of chicken cooked in mango sauce and spices. Tender pieces of chicken cooked in apricot sauce and spices. Boneless chicken pieces cooked with juliennes of onion, tomato, capsicum, carrot and onion sauce. Boneless chicken pieces cooked in a thick onion, tomato, capsicum and cashew nut gravy. Boneless chicken pieces cooked capsicum, garlic, onion slices with fresh lemon. Boneless chicken pieces cooked with crushed garlic. A royal choice meat dish cooked in spices laced spinach. Boneless chicken pietes, cooked in onions and tomato gravy, garnished with egg. Dhansak is traditional parsi dish, cook with lentil and vegetables, sweet and sour taste. Succulent mushroom and onions added to brown gravy and tender chicken pieces flavoured. Mushroom and onions added to brown gravy and tender lamb pieces flavoured. Diced meat cooked in traditional North Indian style. Sauteed lamb with onions and tomatoes, garnished and flavoured with cashew nuts and onions. A royal choice meat dish cooked in spices laced spinach sauce. Tender meat pieces cooked with capsicum, onion and coriander seed. Tender lamb pieces cooked with capsicum, onion, fresh tomato and special sauce. Boneless meat cooked with juliennes of onion, tomato, capsicum and vegetable, tempered with coriander and ginger. Boneless pieces cooked in a thick onion, tomato, capsicum and cashew nut gravy. Cooked with mustard oil , ginger, garlic, onion seeds, fenugreek seed and spice intense in Indian pickle 'flavour normally served hot. Beef cooked in delicious cashew nut sauce. Mushroom and onions added to brown gravy and tender Beef pieces flavoured. Boneless meat cooked with juliennes of onion, tomato and capsicum with vegetable, tempered with coriander. Prawns or fish cooked in creamy tomato flavoured sauce. Deep fired boneless pieces of fish or prawns cooked in spicy sauce with green peppers and sliced onion. Flsh fillets or prawn cooked in a fine tomato paste and curry sauce. Fresh fish pieces cooked in onion, tomato sauce and ground spices. Marinated prawn cooked in charcoal oven and cooked with capsicum, onion,veg and tomato. A prawn cooked in spices laced spinach gravy. Mix seafood cooked in creamy tomato onion gravy and ground spices. Yellow fried rice cooked with cashew and fried onion. Yellow rice cooked with nuts. Yellow rice cooked with mixed vegetables. Basmati rice cooked with seasonal vegetable. Flavoured basmati rice cooked with marinated chicken pieces and spices. Flavoured basmati rice cooked wrth marinated lamb pieces and spices. Flavoured basmatl rice cooked with marinated prawns and spices. Flavoured basmati rice cooked with marinated fish and spices. Slice of selected vegetable, cucumber, carrots, onion and tomato. Chicken / Prawn toast with garlic and mix with vegetable. 4 pieces of papadum serve with raita, mango chutney, mix pickle. The special naan bread cooked in Tandoor (clay oven) is highly recommended with your meal. Hand rolled bread made from wholemeal and white flour, garnished with butter. Plain flour bread cooked in tandoor; garnished with butter. Plain flour bread stuffed with garlic. Special naan from Kashmir. Plain flour bread stuffed with dry fruits and spices. Filled with cauliflower stuffed in. Naan stuffed with cottage tandoori cheese. Naan stuffed with boneless chicken tikka. Naan stuffed with spiced lamb minced mixture.